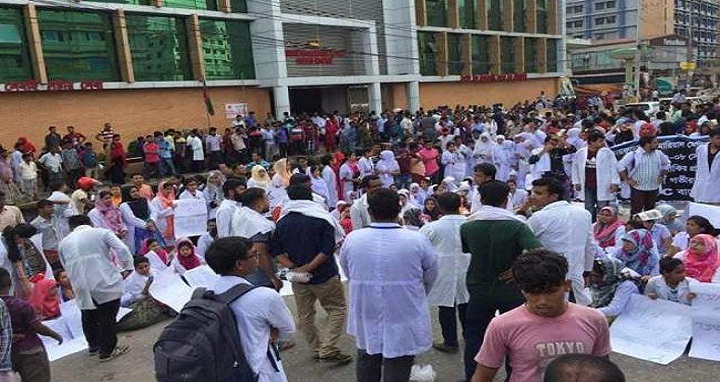 Dhaka, 14 July, Abnews: Students of Tairunnessa Memorial Medical College blocked Dhaka- Mymensingh highway here on Saturday morning protesting the death of a physician in a road crash on Thursday. Salehuddin Ahmed, assistant superintendent of Gazipur district Traffic police, said that doctor Shammir Shakir Prokash was killed after being hit by a BRTC bus in KuniaTargach area on Thursday evening. The students of the medical college put up barricade in front of the college around 9:00am to meet their three-point demand including punishment of the driver, halting vehicular movement on the highway. Following the assurance of police, they withdrew their blockade around 10:15am.